We are proud to deliver a well-rounded comprehensive and professional training program in a Makeup Artist Diploma in the Greater Toronto Area. The objective of our makeup artist programs in Toronto and Newmarket are to provide students with the theory and cutting edge practical training for the exciting world of cosmetics. We concentrate on delivering basic and advanced makeup applications for all areas of the industry by introducing you to new techniques being used today. This program will focus on the fundamental theories and practical applications to ensure each student is successful in day, evening, bridal, runway, camera, period styles and theater makeup application as well as creative makeup design, client services, sales, marketing and professionalism. Each student will work toward a complete portfolio, master the art of makeup design, and compose an up-to-date resume, so that they may launch a new career as a makeup artist in the Newmarket and Toronto area. All students will undertake to complete clinical hours working on guests. In order to fulfill the graduation requirements all students must complete the required practical application component of this program. Written and practical tests will be administered on a weekly basis. A final written and practical makeup exam will be administered. Our student kits are comprised of an arrangement of products from the top professional brand MAKE UP FOR EVER. 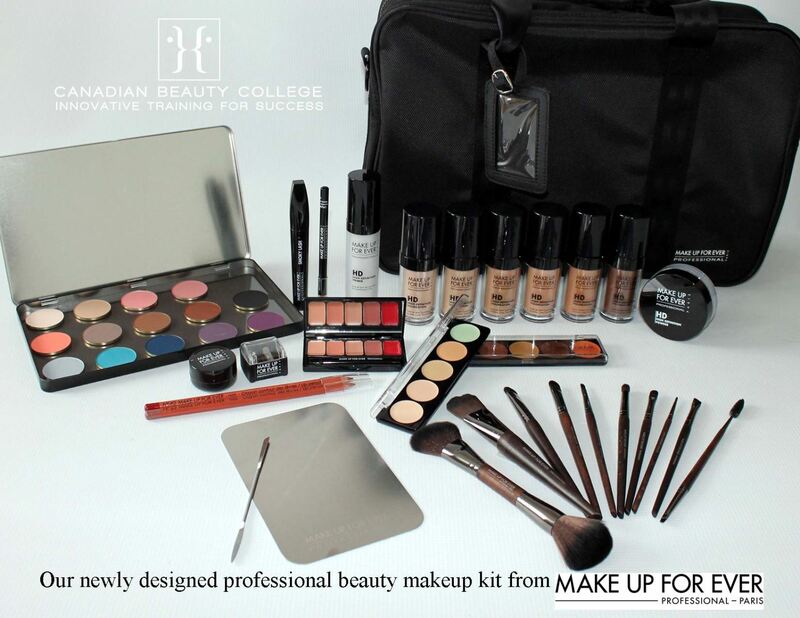 This kit has been designed for a student to be job ready as a makeup artist in Toronto upon graduating. Canadian Beauty College ensures that students are equipped with excellent products and tools to excel in this booming industry. We invite you to look through our online photo gallery which showcases the creative designs of past and present students. Canadian Beauty College is an active M.A.C. PRO member, which recognizes superior excellence in theory and practical application of makeup. Students of Canadian Beauty College's makeup programs are entitled to the M.A.C PRO student discount. Prospective students may also want to explore options or additional courses that Canadian Beauty College offers for professional certification in makeup techniques and application or skin care and esthetics.